Washington Irving is a neighborhood school in name only. Most CPS kids in the Irving boundary choose other schools. Because nearby kids don’t enroll, there is space for others; 80 percent of Irving students are from outside the boundary. Dismissal from Marsh elementary on Chicago’s Southeast Side is a quintessential American scene. The bell rings, kids pour from the school and down the neighborhood’s streets, swinging backpacks and asking moms like Toni Gonzalez for ice cream. Marsh is a classic neighborhood school. Ninety-four percent of the Chicago Public Schools students in Marsh’s attendance boundary are enrolled here, and that’s despite an explosion in families’ options — many more charter schools, gifted or magnet schools to choose from. Kids can even go to other neighborhood schools; while the district once insisted that a child live in the attendance boundary to enroll in a neighborhood school, that rule has been relaxed. But numbers obtained by WBEZ show that most neighborhood grammar schools are moving in a very different direction from Marsh. In 2000, 74 percent of Chicago’s elementary kids went to their assigned neighborhood grammar school. Today, just 62 percent do—and that number is falling. The figures show how much the system shifted over the decade that included Renaissance 2010, a program that gained national attention by opening dozens of new grammar schools and closing dozens of neighborhood schools deemed low-performing or under-enrolled. And they show that under expanded school choice, the relationship between the “City of Neighborhoods” and its neighborhood elementary schools is undergoing a sea change, reshaping the school system and the city’s culture. Take Washington Irving in the Tri-Taylor neighborhood. The picturesque grammar school at the heart of this picturesque neighborhood is largely ignored by the families who live here. In the 2000-01 school year, 69 percent of CPS kids from the community went to Irving. Last school year, just 46 percent of CPS kids in Irving’s boundary were enrolled there — others were at CPS magnet schools, gifted schools, charter schools, or other neighborhood schools (still others were at private schools; those students aren’t captured in these numbers). Since 2000, as Chicago has expanded school choice, 221 of the city’s 368 neighborhood grammar schools have also seen double digit drops in the proportion of kids from their boundaries who choose to attend. “Neighborhood schools in the traditional and historical sense are under pressure, and more in some places than others,” says Jeffrey Henig, who studies the politics of education reform at Teachers College in New York City. While the neighborhood school is still a strong concept in suburban America, it’s taken a “body blow” in cities like Chicago that are trying to improve their school systems through school choice, Henig says. But he notes this isn’t the first time; desegregation efforts chipped away decades ago at the neighborhood schools concept in big cities. In Chicago, that’s how magnet schools were born. The district is trying to make where kids go to school be less about their address, and more about the type of school parents choose. It’s also trying to free families from low performing schools. Tri-Taylor resident Kim Escamilla is not nostalgic for the neighborhood school. “I like how he’s doing in school, so if I have to drive I’ll drive,” says Escamilla, who brings her son to Rowe Charter School on the Near Northwest Side. Escamilla recently moved to Tri-Taylor. But the friends her son has made on the block scatter for school. “None of them go to Irving, down the street,” she says. Of course, if you peer into any school, there are issues are at play beyond the district’s expansion of school choice. Race, class, neighborhood change, an exceptional principal or a terrible one — all can affect whether nearby kids choose to attend. But overall, there are 73,000 fewer Chicago kids attending their neighborhood school today than in 2000. WBEZ made a map that shows how Chicago’s ties to its neighborhood schools have weakened as the city has expanded school choice. The map plots out the 100 new elementary schools Chicago has opened since 2000 — nearly all citywide admissions schools, where kids apply and a lottery lets them in. And it shows 102 school closures — nearly all of them neighborhood schools with community attendance boundaries and guaranteed admission for kids there. “This speaks to what we’ve been saying, that Chicago Public Schools is getting out of the neighborhood schools business,” says Jitu Brown, an organizer with the Kenwood Oakland Community Organization who has argued that district budget cuts and school closings have undermined neighborhood schools. Chicago’s shift away from neighborhood schools has implications that go beyond education—for property values and community development, for schools’ relationships with their communities. Brown thinks weakening ties to neighborhood schools is one reason for the violence tormenting Chicago. Nowhere has the exodus from neighborhood schools been more stark than in Chicago’s African American neighborhoods. Others believe the system we’re moving to is promising. They say families will invest in down-and-out areas if they aren’t required to send their kids to the neighborhood school. They note that neighborhood schools in a segregated city separate kids along race and class lines. And they say starting new schools—and letting families choose—is the fastest way to break cycles of poverty. WBEZ’s map shows community buy-in to neighborhood schools remains strongest in Latino neighborhoods, and in geographically isolated neighborhoods like the Far Southeast Side (where Marsh Elementary is located) and the Far Northwest and Southwest sides. The map also shows a shrinking school system, with 50,000 fewer elementary school kids in CPS today than in 2000-01. Loraine Herbert’s neighborhood school is just a block from her home in Englewood. But she feels there’s too much gang activity in the area, so to keep her seventh-grade son safe she takes him and a younger sister two and a half miles away on two CTA buses, to another neighborhood school— Burke Elementary near Washington Park. Herbert’s case highlights another dynamic in Chicago’s evolving school choice system: 52,963 grammar school kids choose neighborhood schools that are not their own. That’s almost as many kids as attend charters, gifted schools and magnets combined. That figure is 56,709. And though Herbert loves just about everything at Burke, the school is on probation, and CPS gives it the lowest of three performance grades. 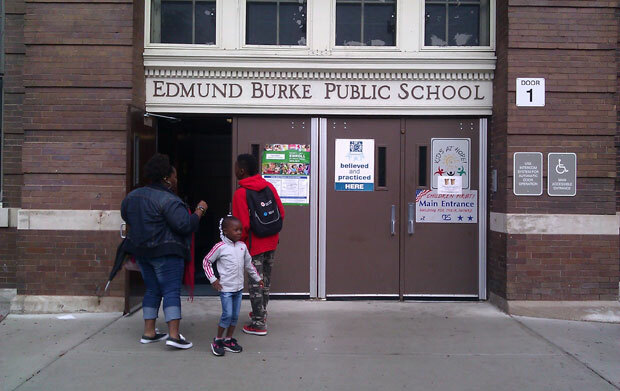 Every day, 683 kids who live in Burke’s attendance area leave for other CPS schools. Meanwhile, 128 kids like Herbert’s travel to get here. Every year, more grammar school kids are crisscrossing the city this way. The same morning WBEZ accompanied Hebert on her route to Burke Elementary, we met another mother traveling with her two kids. Also citing safety, she takes the same two buses as Herbert but in the exact opposite direction. And one more mom we met traveling that day, Tiffany Holmes, says she’s glad the district doesn’t seem to care anymore about attendance lines. That has allowed her to leave her son at his current school even though the family has moved out of the area. It’s a better school than his current assigned neighborhood school, she says. But Holmes holds no particular allegiance. A Catalyst report from 2008 found that under Chicago’s choice system, African American families in particular were often traveling long distances for low-performing schools. No similar analysis has been done since. WBEZ found dozens of schools are now “neighborhood schools” in name only, enrolling more kids from outside the attendance area than within. “The number of children who make the choice to attend their neighborhood school has changed. And I think it has to do with a district that perhaps did not place its resources in its neighborhood schools,” says schools CEO Barbara Byrd-Bennett, who took over leadership of CPS a year and a half ago. “What I’m hell-bent on doing is to ensure that our neighborhood schools get the same opportunity — are held to the same criteria — but that those schools are quality as well,” she says. Byrd-Bennett says the district is now investing in neighborhood schools. She points to an initiative created under her watch — the Office of Strategic School Support Services, or “OS4” — dedicated to improving the lowest performing neighborhood schools. And she touts International Baccalaureate and STEM programs added or expanded at grammar schools. A ‘nascent backlash’ against choice? Jeffrey Henig, the Teachers College professor, says the argument that families trapped in bad neighborhoods should have some option other than a crummy local school is a powerful one. Henig says whether neighborhood schools survive depends on whether there’s a constituency interested in defending them, one that’s politically strong enough. “In many cities there’s at least a nascent backlash against choice schools and a rallying around the idea of protecting neighborhood schools,” Henig says. And in pockets across the city, parents looking to avoid long commutes, gifted testing at age 4, and lotteries are taking a second look at their neighborhood school. Kim Silver spends hours plugging McPherson Elementary, in Ravenswood. On tours, she shows off her neighborhood school’s project-based learning, smaller class sizes, and technology, including iPads for all third-through-eighth graders. 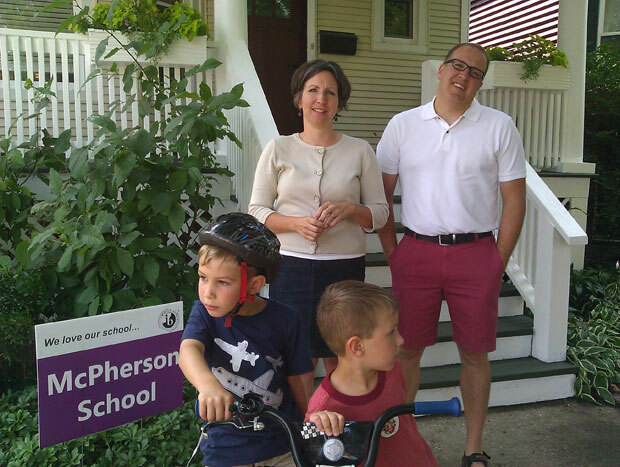 A bright purple yard sign Silver designed announces that her kids go to McPherson. They’re the only ones on the block who do. Other kids here go to magnet or gifted schools—some 45 minutes away. Silver says she knows of one nearby family who bought a condo in the West Loop to get their second child into the same school as the first. They come to their Ravenswood home on weekends. WBEZ found that since 2000, only 16 neighborhood schools in the city significantly increased the proportion of neighborhood kids choosing to enroll. Nearly all are schools with cachet, in higher-income areas — Nettelhorst, Lincoln, Coonley, South Loop. Several of those schools — and McPherson — are in the 47th ward, where alderman Ameya Pawar has a specific campaign to strengthen neighborhood schools, and get more residents to enroll in them. Pawar says neighborhood schools are an economic development engine in suburban communities; there’s no reason they can’t be in big cities as well. Right now, a growing number of Chicago families are looking beyond their neighborhood school for that peace of mind—or at least, for what they see as a better school. Click here for a larger version of this chart, including all years from 2001-2014. All data used to report this story is posted below in an Excel file.